Finally, it’s the exciting day you’ve been anticipating for months, maybe even years. Your new puppy is ready to come home with you. You’ve gotten your crate, food, and other supplies, you’ve chosen a place for training and socialization, and you’re ready to start an amazing adventure with a little ball of fluff who is going to become your best friend. Whether your pup is coming from champion show lines or from a local shelter, a first step is a trip to the vet. Breeders generally include a veterinary examination, usually within three days, on their contracts. They also will require yearly physicals and necessary vaccinations as a condition of sale. If you get your pup from a rescue or shelter, where dogs have unknown backgrounds and may have been exposed to contagious diseases, an immediate exam is even more important. It’s a good move to have a trusted veterinarian give the puppy a once over. Another good reason for putting a vet visit on the priority list is to establish an important connection, something that the American Veterinary Medical Association (AVMA) calls the VCPR, for Veterinary-Client-Patient Relationship. This exists, according to AVMA, when “your veterinarian knows your pet well enough to be able to diagnose and treat any medical conditions your animal develops.” The only way to establish this is by visiting the office, so the vet gets to know what is normal for your dog, and what might be signifying an illness. These wellness visits will continue throughout your dog’s life, in much the same way as many humans go in for annual checkups, even if they are feeling fine. The best veterinarians have busy schedules, so if you know exactly when you’ll be picking your puppy up, call in advance to get a convenient appointment. Don’t wait until the last minute. You should also try to visit the clinic before your puppy comes home. Look around and see if you are at ease there, that the support staff seems friendly, and the facility is clean. Most vets will take the time to chat with prospective clients. This can be very helpful because it’s important that you are comfortable enough with this individual to ask questions. You will have lots of them when your new pup comes home and you want someone who will treat your concerns with respect. Also, find out about the clinic’s after-hours setup. One great truth about life with puppies is that emergencies rarely pop up from 9 to 5. Know what to do in the case your puppy gets an ear infection in the middle of the night, and that includes making plans for transportation to the facility. Remember to bring any paperwork, such as medical records from the breeder or rescue, so the vet can include these in your dog’s file. What will this first puppy veterinary visit cost? That has very much to do with where you live. Prices of veterinary care will differ widely by geographic region. Practices in urban areas will generally charge more. Getting a health insurance policy for your puppy right after this first exam is a good idea. It could save a life in an emergency. If you are extraordinarily lucky, your vet visits will be for routine stuff—vaccinations and wellness checkups, for example. But few dogs go through life without some issues. Puppies are prone to ear and urinary tract infections and they have a tendency to eat things they shouldn’t or fling themselves off high places and get injured. You may think you have your home perfectly puppy proofed until a pair of inquisitive jaws show you what you forgot. Vomiting and diarrhea—These are unpleasant facts of life, everyday occurrences for most dog owners. But if it’s becoming chronic (meaning several times a day) you should call the vet. Also, call the vet immediately if the dog is throwing up and has the runs at the same time. This could be a sign that your pet has swallowed poison or a foreign object. Loss of appetite—Most puppies and dogs love to eat. Refusing food is a cause for concern, especially in breeds, like Labrador Retrievers, that are known for their insatiable appetites. Increasing water consumption—Consuming huge amounts of water is an early sign of kidney or thyroid disease or diabetes. Oozing eyes—This could be a sign of infection or injury. Irregular urination—This could mean a urinary tract infection (UTI) that must be treated with antibiotics, especially if the dog is uncomfortable and asks to go out frequently, but only dribbles small amounts of urine. Being Bad—A happy puppy who suddenly become irritable may be in pain and should definitely be seen by a vet. Raising a puppy can be one of the most rewarding experiences you will have in your life, but, in many ways, it can also be one of the most terrifying. Establishing a solid relationship with a good vet right from the start is a vital step toward giving your pup the best chance at a wonderful, healthy life. 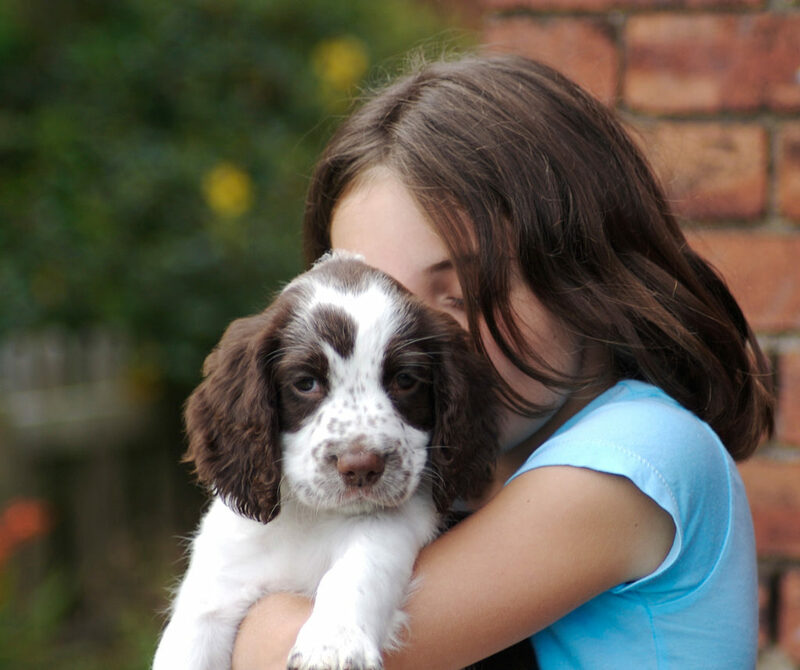 To ensure a healthy and stress-free puppyhood, purchase AKC Pet Insurance.